Now available! "Getting Past Getting Lucky" - A simple guide to making the most important decision of your life. "Civitas Island - The Birth of Hope"
Trailhead Press is an independent book publishing company based in Bellevue, Washington. Our mission is to promote thought-provoking books, both fiction and non-fiction. We are excited to feature the work of Robert Rosell including his first novel, Virtually Yours, Jonathan Newman, and the sequel, Civitas Island - The Birth of Hope. Who is reading Trailhead Press books - and where? Send us your pictures! Musician Ro Patterson reading "Civitas Island - The Birth of Hope" at the Wailing Wall in Jerusalem. 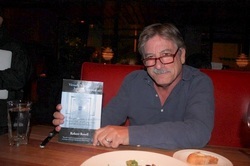 Movie producer Barry Bernardi (Zookeeper, Anger Management, and 53 other films) reading VYJN at Houstons in Santa Monica. 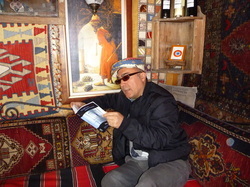 Entrepreneur and tour guide extraordinaire Ömer Elkay of Curio Travel reading VYJN in a tea house near the Fairy Chimneys of Cappadocia, Turkey. Ro Patterson enjoying "Virtually Yours, Jonathan Newman" on a beach in Bora Bora. 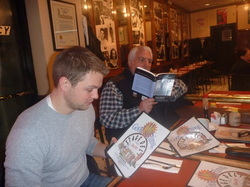 Advertising executive Rob Resnik reads VYJN while waiting for his hot pastrami sandwich at the Stage Deli in New York City. 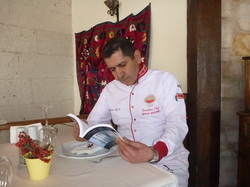 Renowned chef Yilmaz Usta takes a break from the busy kitchen at Alaturca Anatolian Restaurant in Nevsehir, Turkey, to enjoy some private time with VYJN.